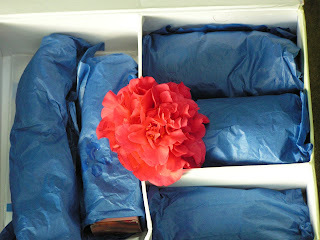 I got a fabulous box from my SP10 Secret Pal this week. Previously she sent me this adorable Vogue book on felted items. Sure enough there are several things in there that I can't wait to make. NOT that I need more projects but there is this adorable plaid bag and . . . Then on Monday this big box arrived. What a nice way to start the work week. I opened it and found the most wonderful things. First it was all organized in these nice need sections. Then I opened each one and found surprise after surprise. 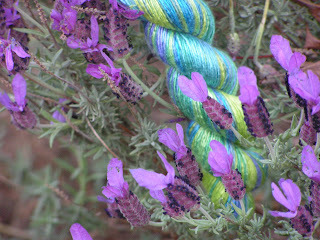 This AMAZINGLY soft and gorgeous Art Yarns silk yarn. The colorway is just scrumptios with the purple, teal and yellow. Any suggestions on what to make? Then there were two gorgeous skeins of Noro, hand lotion, candles and these totally cool gloves with polka dots to put on your hands after the lotion. They are so cute but they were too shy for a good photo. THANK YOU SO MUCH to my wonderful SP10 pal. You are so good to me. I love all my gifts and can't wait to use them! Everything's lovely! I'm a tad curious...what kind of flowers are those lovely purple ones? ...very unusual and interesting? Just selected you next treat last night! So happy we have such similar tastes! ps: the phone was under my desk and the ringer was set to vibrate - thankfully all is now as it should be. Thanks for the kind words. In respons to Hakucho's question the flowers are called Mexican lavendar. It's actually sort of a bush. I'm not sure what the official name is but you'll see them a lot in Northern California. They are fairly hearty but they look so pretty! An awesome package from your secret pal! 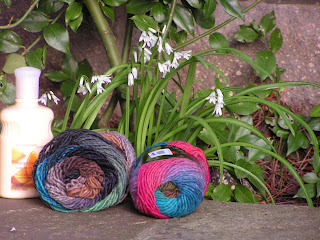 One of the Noro skeins looks like the ones I had not long ago (I think it was colour 165) and made into a scarf. 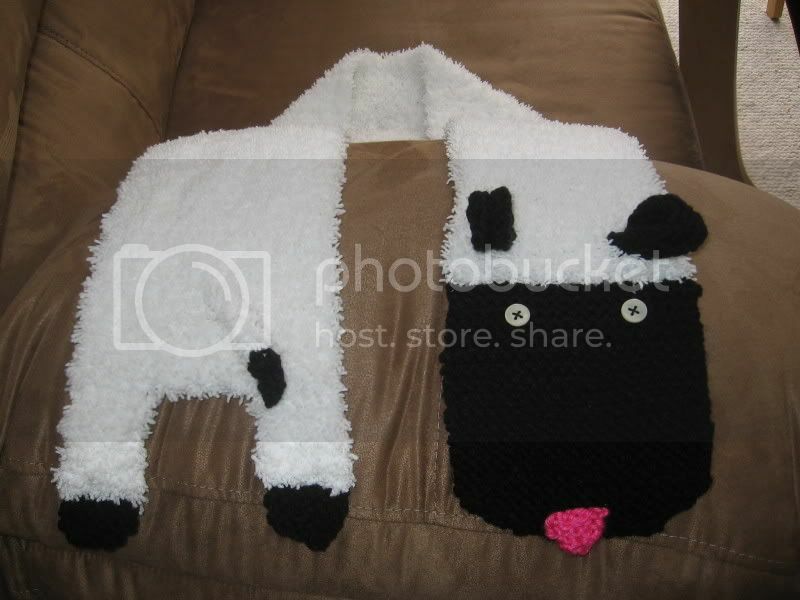 I have pics on my blog of the scarf; you'd have to scroll down to see it though. It turned out quite nice. 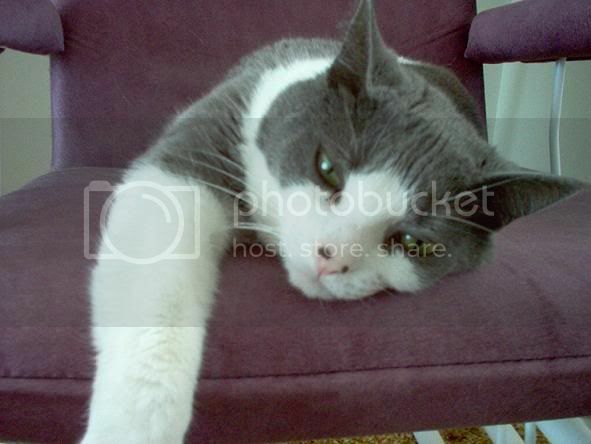 WOW you have a great secret pal and your pictures are beautiful.